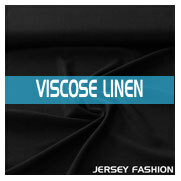 Jersey Fashion - Your finest fabrics online! From timeless standard fabrics to fashionable fabrics with print. Our Spring 2019 / Summer 2019 fabrics collection has been built up with the finest European fabrics from e.g. Germany, France, Austria, Spain and Italy and from renowned brands like Hilco and Toptex. The best wardrobe is created with the right basics.... Our basic fabrics collection consists of a wide range of fabrics. From high quality bamboo jersey, cotton jersey, viscose jerseys, heavy jersey fabrics, stretch twill, stretch and bio linen, stretch lining, stretch crêpe, stretch satin, stretch jacquard weave fabrics, satinized stretch cotton to waffle fabrics in different standard & fashion colours. Our designer fabrics collection contains flower prints, retro & paisley prints, polka dots, animal prints, abstract and digital prints on viscose jersey, cotton, silk and linen. Many of our fabrics are shown in issues of pattern and sewing magazines like the Burda, Ottobre design woman, Sew Magazine, Vogue patterns and Knipmode. Creative customers - both hobby and profesional - from f.i. the UK, US, Canada, Australia, Scandinavia, Israel, New Zealand, France, España and even Brunei, India, China and Africa already discovered our delivery service and high quality fabrics.